Ask rose enthusiasts what one plant disease they would vote off the face of the planet, and their answer will inevitably be Black Spot. It is the bane of the rose growing world, and has been for many years. There is no rose that is truly black-spot proof, but thanks to the introduction of many new rose cultivars with built-in Black Spot resistance, this problem isn’t what it used to be. Varieties to consider for their ability to resist this diseases are selections from the Knock Out Family, Easy Elegance, Bonica, Carefree Beauty, Cuddles, Simplicity and The Fairy to name a few. But what if you are nursing a rose that isn’t quite so sturdy? As the name suggests, this fungal disease appears as circular black spots surrounded by a ring of yellow on infected leaves. Prevent it, before it starts. Black spot spreads quickly in warm weather so spraying with a fungicide prior to the known weather cycle is ideal. 1. First, don’t irrigate late in the evening before water has a chance to evaporate from leaf surfaces. Better yet, water at ground level and don’t wet the leaves at all. Also, make sure there is plenty of air flowing around and through each plant. Fungi love to grow in moist, stagnant air, so prune your roses periodically, especially after each bloom period. 2. Keep a clean garden – Remove and destroy infected leaves and canes. 3. 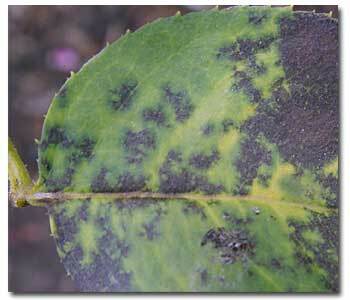 If you do find yourself with a case of Black Spot, act quickly, as it can take over an entire rose bush in no time. A teaspoon of baking soda per quart of water is an effective fungus fighter. 4. Use a fungicide – There are many chemical fungicides available that are very effective such as Spectracide® Immunox® Multi-Purpose. If you’re an all-organic grower, try Neem® oil, which boasts both insecticidal and fungicidal qualities, and won’t harm beneficial insects.